I used a tiny piece of removable tape to hold the stencil in place. I'm going to have to use a different type of removable adhesive though, because even the tape left a slight impression in the paper - LOL. These are the wizard pads - two come in the package. ETA: New wizard kits come with two tan pads, rather the tan and black pad. Please replace the black pad with the tan pad wherever I have it listed as a suggestion. Now I just need to figure out how I want to embellish and use this. Then I started thinking - pretty scary right?!? LOL! What else do I have that I could sandwich for texture? Hmmm, this is a "charm" embossing kit. Oh WOW, what about letters?!? So that is precisely what I sandwiched next. and paper - I can hardly wait to try some other materials such as vellum, thin metal... Can you imagine the possibilities? 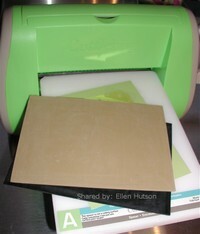 I'm also thinking I want to find some Paper Glide - this is supposed to enhance your dry embossed image detail. I love crisp details! OH WOW - what about those Fiskars texture plates I have sitting in the drawer that I purchased years ago and did "NOTHING" with! So I took a couple of the things I sandwiched and made a card to express my feelings at this time of year. Once again I am thankful for so much! There is so much I am grateful for: family, friends, hope, faith, the many of you who have been here sending your thoughts and prayers my family's way. Please know that I am thankful for you! Your support and encouragement - they mean the world to me - I appreciate you! Have a wonderful Thanksgiving day!!! I would like how to use Mery's stencils with my Cuttlebug. 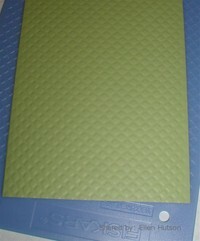 I tried using one of my Fiskars texture plates with my Cuttlebug & funfoam, but didn't get the best image. I've since gotten the Wizard pads (tan), but haven't had a chance to use them. You mentioned using chipboard as a shim, but I'm wondering where to get a large enough piece of chipboard. All my chipboard is precut into various shapes & sizes. 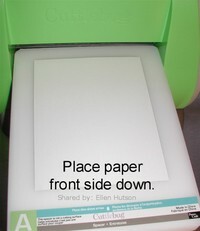 Im going to try this out, I have only 200 regular stencils I can try. I have been seeing Cuttlebugs at Hobby Lobby and did not know what they were. Today I have been looking at various die cut machines and it looks like you think this is the best! Can you cut out letters with this? Thanks! Thanks for all the info. I finally picked up a cuttlebug today. Your information helped me decide. Oooooh! I too will be buying a Cuttlebug thanks to you! I was already thinking about it, but didn't see a very wide selection of embosser thingys (I'm new at this!) so knowing that you can use ANYTHING, I'll be using my 50% off coupon for Michaels and buying myself a birthday present for my husband to give to me! :D THANKS!!! Oh Ellen!!! You are the reason I will be buying the Cuttlebug tomorrow! I saw a message from militarystampingmom on the Stampin Up With Beate group that listed your website as a place to find a compatability chart for the brass templates and the Cuttlebug. Well, I thought the brass template embossing was just abosutely awesome but then when I saw you used your Fiskars Templates that did it for me!!! I have all those darn templates and have never used mine either and now I have got to get that Cuttlebug just for those Fiskars Tamplates!!! Thank you so much for helping me to feel better about wasting money on those templates. LOL!! Now I know I will definitely use them!! You're awesome! Thanks for all the wonderful inspiration and the incredible blog! I finally got the wizzard charm embossing kit! I am playing and having fun and discovering! I wanted u to know i tried it with plastic stencils too, the flimsy kind, and it worked too! 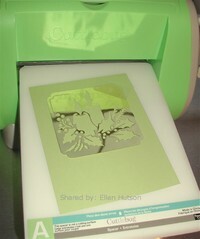 now all my embossing is cuttlebugged! love the texture plates in it too! Thanks so much for posting your ideas. Yours cards are beautiful. I just purchased a cuttlebug and have no idea what to do with it! I just got a CB a few months ago.... I had an impossibly hard time finding the Wizard charm embossing kit and was so desparate to use my Fiskars plates that I improvised with craft foam! I determined that 2mm and 3 mm foam sheets will both work, but the impression is much better with 3mm. I believe I did the following: plate A from CB, fiskars plate, paper, foam, and then one or both of the B plates. The foam doesn't last for but a few rounds, but it was enough to get me through my Christmas cards, and it is inexpensive and easy to find! Okay - I have one more question about this that I've not seen addressed anywhere... but first, let me confirm that I have the basic information correct. The Cuttlebug, Big Shot and Wizard will all do pretty much the same thing. Are all manual? The Big Shot and The Wizard have an obvious lever, but what powers the Cuttlebug? The Silhouette and the Cricut also do about the same things as each other - both need computer assistance. I know I want to wind up with one that die cuts and embosses and one that I can hook up to the computer and get creative with. Input from experienced users would be greatly appreciated! 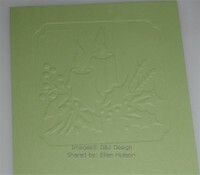 Has anyone tried cutting/embossing with the Spellbinders dies? I can't seem to figure it out. Thanks. Hi thanks for the hints ... can anyone help Ive just bought a cuttlebug and trying it out with different dies and things I read somewhere that you can do eyelits if you have a shim can anyone tell me what a shim is ???? Would a repositionable and removable adhesive like Dotto or one of the repos/temporary tape runners work between the brass stencil & cardstock? Thanks for posting your finds. When you use the fiskars emboss plates do you need to use any other shimmies or such. Thank you for your advice and research and for sharing this knowledge. I got a CB at Michael's for 50% off and can't wait to start using it. What are the charms embossing kit you used for the "thankful?" And---this is probably a really, really stupid question---but do you you think you could use a stamp through it? Would it squish? I'm thinking embossing a rubber stamp design. ??? And I'm too scared to experiment. OMG! I just pick up my new cuttlebug at JoAnn Craft and Fabrics today. I used their 40% off coupon with no questions asked! Please pass this along to your friends. And you didn't pick up one for me????? Of course, I sold all my brass stencils when my tendinitis got so bad . . . boy, do I regret that today!!!! I had quite a collection . . . argh!! !